WWW, November 2009 - Last August 17, the Dubroom started with a brand new daily series of MP3 reviews, all coming with a free and legal direct download link on the review page. Here's the schedule for the month of November, 2009. 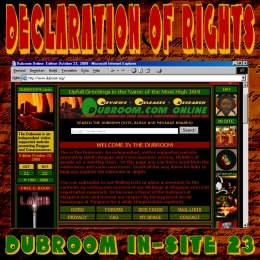 WWW, October 2009 - Sometimes, the Dubroom is criticized for having banned people from the Message Boards because of what they call is an infringement of their "right to freedom of speech". Does this right enable anyone to say anything on any site, and whose right is it anyway? WWW, September 2009 - Last August 17, the Dubroom started with a brand new daily series of MP3 reviews, all coming with a free and legal direct download link on the review page. Here's the schedule for the month of October, 2009. WWW, August 2009 - Last August 17, the Dubroom started with a brand new daily series of MP3 reviews, all coming with a free and legal direct download link on the review page. Here's the schedule for the month of September, 2009. WWW, August 2009 - This month marks the start of what is not only a very interesting period when it comes to downloading free and legal High Quality MP3 files, it also marks the end of a feature in the Dubroom MP3 Portal that was there for many years: the Emusic Portal. Read all about a very exciting time ahead!